On 9 May, the United Nations Conciliation Commission (UNCC) concerning the Timor Sea dispute between Timor-Leste and Australia released its final report. This was the first time such a form of compulsory dispute resolution had been invoked, with the proceedings initiated in April the year before under Annex V of the United Nations Convention on the Law of the Sea (UNCLOS). The final report offers insights into both the successes and limitations of this “new” approach to dispute resolution. The experience prompts a question: might conciliation provide a novel approach applicable to the numerous other enduring maritime disputes in the Asia-Pacific region? The primary mandate of the UNCC was to assist the parties to reach an agreement on permanent maritime boundaries. To that end, the UNCC can be regarded as a success. It helped achieve a significant breakthrough on this long-standing and contentious aspect of the Timor Sea disputes. 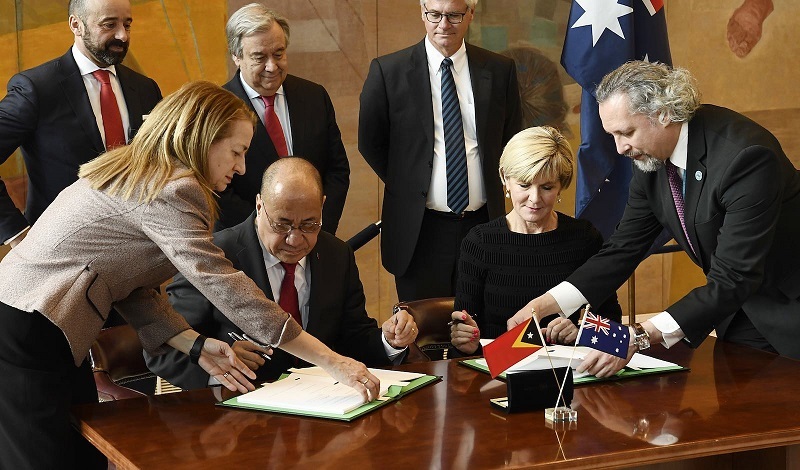 In March 2018 Australia and Timor-Leste signed a treaty establishing maritime boundaries in the Timor Sea. But the commission’s task went further. During the proceedings, the parties asked the UNCC to extend its mandate to include facilitation of an agreement on the development concept for the Greater Sunrise complex of gas fields. This expanded the initially bilateral negotiations involving Australia and Timor-Leste to involve the joint-venture partners, headed by Woodside. While the boundary treaty included different revenue-sharing arrangements dependent on whether the pipeline ultimately brings the resources involved to shore in Australia or Timor-Leste, agreement on the “development concept” for Greater Sunrise has thus far remained elusive despite the efforts of the UNCC on this crucial aspect of the dispute. The biggest strength of the UNCC has been providing the parties with opportunities to find alternative ways of conceiving the problem and possible solutions to it. For example, a key dispute between Australia and Timor-Leste concerning the position of the maritime boundary was not the dividing line in the central part of the Timor Sea, as much of the commentary focused on, but the lateral lines, particularly the position of the eastern lateral line that cuts through Greater Sunrise. While Australia initially preferred a simplified, strict equidistance line, Timor-Leste advocated a modified equidistance line. The states were ultimately able to agree to modified equidistance lines for both lateral lines, including a unique “dog-leg” configuration for the eastern lateral boundary line. This boundary arrangement represents an innovative compromise and is an example of what the commission report refers to as “flexible pragmatism”. Engaging the parties was critical to the success of the UNCC in helping broker the boundary agreement. While Australia was initially reluctant to engage, objecting to the competence of the commission, once that argument was lost, it participated in “good faith”. The constructive approach of both parties was crucial to the final outcome. In particular, the UNCC process was able to assist Australia and Timor-Leste to agree on maritime delimitation by proposing confidence-building measures designed to foster trust between the parties and also between the parties and the Commission itself, offering structured proceedings, coupled with informal discussions and one-on-one sessions with both states, actively assisted by skilled and experienced neutral conciliators with legal, diplomatic, and political backgrounds allowing for innovative options to be discussed. The UNCC, therefore, has considerable merit and could be applied to other maritime disputes. Yet the process itself was still a negotiation, even though an assisted one. The commission could not impose a solution because its recommendations were explicitly non-binding. Materially, the issue of the development concept for Greater Sunrise is the most important, and most contested, aspect of the dispute. The UNCC interpreted its role as being to provide the parties with a neutral assessment of the development options to enable them to make an informed decision rather than recommending a particular development concept. Despite this input, no definitive agreement on this issue has been reached. Fundamentally, the capacity of conciliation efforts to help states arrive at negotiated solutions depends upon how wedded states are to their claims, and how invested parties are in resolving the dispute. More complex disputes in the South and East China seas involve multiple states making maritime, exclusive economic zone, and island sovereignty claims in the context of increased militarisation and distrust, especially where nationalism plays a prominent role in states’ preferences to defer resolution for domestic political purposes. In such complex and highly contested cases, conciliation efforts such as the UNCC may find it challenging to navigate the multiple and contested visions arising from national and symbolic claims.